Shaalom 2 Salaam: A Muslimah's Journey Along the Way From Judaism to Islam: Do Muslim demands at Harvard safeguard rights or promote something more troubling? 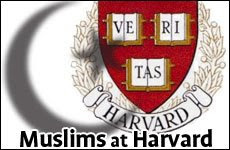 Jonathan S. Tobin has a thought-provoking article up at Aish.Com concerning Muslim women at Harvard. The debate is based upon the request of Muslim female students and their desire to have female-only access to one of Harvard's gyms. While it is a nice philosophical debate, I don't see what the big fuss is all about. Truthfully, I'm surprised that Harvard doesn't have a female-only gym in the first place. It seems that some think that granting this accommodation to Muslim students is only the beginning of Muslims taking over. You're right, it is surprising that Harvard doesn't have a female-only gym. Once upon a time, Harvard had a whole campus just for women, Radcliffe. Great Article btw....lol @ "...Muslims taking over..."
what happend to the free-exercise clause in our first Amendment??? We have had women only hours here in Toronto like for ever! And mostly used by non-Muslim women too. Having said that I don't see why Muslim women fully covered needs to have the gym to herself. This doesnt have to be about just Muslims. I wonder if the Muslim who requested it looked to see if they could get some orthodox Jewish women who attend to go along with the request? - What about conservative Christian women? Sometimes the Muslim community ought to try and not just frame this as a "Muslim" issue and include others to whom modesty is important. "The policy only applies to one gym, a facility mainly used for intramurals. Because of its location at the edge of campus, it is the university's least used gym, Mitchell said. The women-only hours are of minimal inconvenience because they are just six out of the 70 hours a week the gym is open, Marine said. Could everyone be upset because the request was initiated by Muslims? Or that the real anger is due to the "blaring" of the Adhan during Islamic Awareness Week? On the subject of Harvard...there's a lot of reasons why I haven't posted about this so far on my blog, and generally I'm just tired of hearing about it. Anytime anything happens to or because of a Muslim person, it's assumed that first of all it's because of their religion and second of all that they want shari'a law to rule America and actually expect this to happen. Seriously. I don't know how many times I ended up snorting tea out my nose at seeing article titles like "Shari'a at Harvard" after this crap broke out. I attend a university that started out as an all-women's college and stayed that way up until the 50s, and if someone tried to institute women-only gym hours here...oh boy. I can only imagine the uproar. I'd love it because I only just now got the money to buy a swimsuit that complies both with hijab and (hopefully) with my school's code on what can be worn in our gym. At least Harvard's probably slightly more integrated than our lovely, quaint little Bible belt college town. I agree that the women who requested this probably should have tried to include more non-Muslim modest women, or that maybe the school itself could have stemmed the tide of "sexism" cries by instituting women-only and men-only gym hours (and for more than six hours a week...sheesh...that's practically a joke, IMHO). But the fact is, these women go to school there, they have the right to request this, and if anyone else wants "special accomodations" they have the right to request it as well. Because the gym is a meat market here and people dress up and go there to get picked up like it's the club, it tends to be very, um, male-oriented to begin with, so in my opinion having female-only hours would be an attempt to equalize the playing field far more than it would be sexist, anyway. I'll be waiting for that memo with the instructions for the handshake, lol! As-salaamu 'alaikum, Sister. I landed here via my dear sister, Meghan's good word about you. I've instantly come fond of your bloggings (and story) upon entering. I'm new here, myself, but shall have much more to come, in'sha'Allah. Take care and stay clear. Wa Alaikum As Salaam Brother Abdul-Vakil! Welcome! And thank you for stopping by. Insha Allah you will visit often.